A year ago when I presented my work with Anatoli and Koen in Shanghai about using different types of Sentiment Extraction Tools to measure and predict brand equity, someone pointed me onto Latent Topic Modeling. These people from Computer Sciences highlighted the vast potential of this type of unsupervised learning when it comes to understanding textual data. Latent Topic Modeling is another interesting sort of algorithm that identifies clusters of latent topics within text documents. You basically feed the algorithm with some text inputs (e.g. different documents, chapters, speeches, tweets, facebook posts, whatever you can get), and the algorithm will try to find similar patterns within the different documents. The idea is that patterns are related to topics. So the occurrence of words or the co-occurrence of word combinations will be related to specific topics. I am not sure if it is mathematically and conceptually correct to compare LDA with Cluster Analysis, but basically you also try to find cluster of words that occur together and therefore indicate a specific topic. If words have similar likelihoods to occur, they might be related to a similar topic. The TermDocumentMatrix (TDM) is a two-dimensional matrix. Each row contains a term featured in at least one of the documents (even though that while preparing your matrix you may want to set rules to exclude rare and unnecessary terms). Each column represents one of the documents from your corpus (i.e. list of documents). Each cell then indicates whether the term of the row was present in a document (usually done by a dummy indicator taking 1 and 0). The DocumentTermMatrix (DTM) is just an inverted version of the TDM. Here the columns represent all words occuring in the documents and the rows are representing the documents. Again dummies are used to indicate the presence of a word in a document. In case of the DTM a document can be indicated as a dummy combination. Having started my research career with discrete choice experiments, DTMs actually reminded me a lot of experimental design plans, which helped me to get quickly familiar with the concept. Both, TDMs and DTMs are sorts of sparse matrices, as the number of zeros significantly outnumbers the ones. For Latent Topic Models, there are different algorithms and models available. Most commonly people use these days so called Latent Dirichlet Allocation (LDA) models for latent topic identification. R has LDA included in its powerful (topicmodels) package. LDAs use DTMs to identify topics within text. Alike classic cluster analyses (i.e. k-mean clustering) it is upon the researcher to determine apriori the number of topics. This might be a problem, as especially in marketing research people will criticize that the choice was arbitrary or driven by the researchers wish to find specific things within the data. I personally (not having too much experience with LDA and NLP) see two ways to cope with this issue. On the one hand the choice of k (number of topics) could be lead by theory. Previous findings or strong theory may guide a researcher. On the other hand, data itself may give some indication the optimal number of topics. I personally found this discussion on stackoverflow very helpful. But lets get a bit more concrete. People are still wondering how Donald Trump could get into office. LDA may not fully answer this question, but be helpful to identify his most often used topics during the elections. 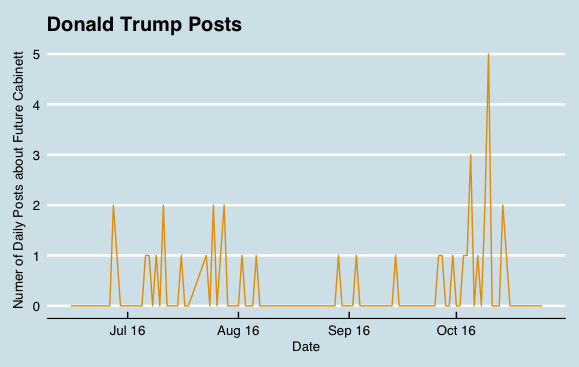 I used R and Pablo Barbera’s wonderful package Rfacebook to extract all posts from Donald Trump from June 2016 to October 2016, shortly before the elections. 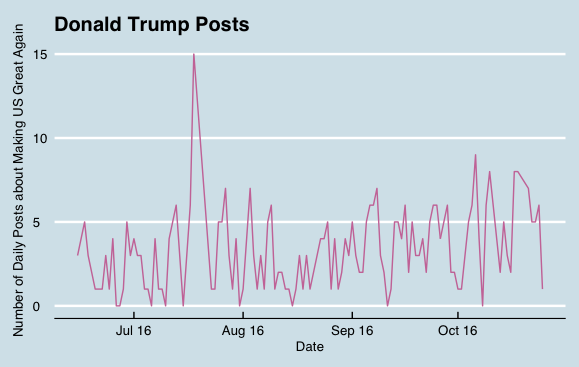 In total Trump 1058 times on Facebook during this period. To clean the data and get it into a DTM, R’s tm package is the weapon of choice (as always when it comes to text data and R). Please note that the code below works wonderful on a MacBook Pro. I do not give any guarantee that it will also work on any other computer, as text data usually provides you with a lot of challenges because of UNI-Code issues. Still I am sure it will be quite helpful. So now we have everything ready to prepare our DTM. You will be surprised how easy this is in R.
However, unfortunately it turns out that Donald sometimes does not have much to say. In some cases he only shares content, without leaving a message. This leads to some empty rows in our DTM, which will late create problems when estimating the LDA model. Therefore we have to clean the DTM from any empty observation. Still we want to have later a data set where we can assign the identified topics to the original messages. Therefore we need to do a bit more than just cleaning. In addition to the DTM cleaning we also need to clean our raw set from the empty messages so that things are still related to each other. Now we can finally run our LDA model. I suggest that before you just copy/paste my code, you better look at the different options. LDA involves some heavy statistics and procedures like Gibbs Sampling. In my example here I just follow the suggested starting values (like presented here). Still you may want to play around and use other starting values. Or you want to use instead of a Gibbs Sampler approach another LDA model approach (just check topicmodels wonderful helpfile to see the other options available). Also Grün and Horning (2011) give a very helpful hands on discussion of the options you have in LDA and when to best use which one. For now lets use the standard parameters. It is time to choose the number of classes now. I read quiet a bit around. FiveThirtyEight highlights up to 12 different election topics for the 2016 presidential elections. Some other sources speak about 4-8. I tried different number of topics and finally used the data based approach above that guided me to an optimal number of 4 topics. Now we can finally run the LDA model. It will take some time. I am using a MacBook Pro (Late 2015, with 32GB of working space) and I had some results after 4 minutes. Increasing the size of the corpus will therefore certainly involve longer estimation times! Keep that in mind when you play around with larger datasets. I am also quit sure that creating the DTM will take much longer if you face a larger corpus. So now lets see what we have found. First we can inspect the 10 most common words found for the preset number of topics. Topic 1 apparently is all about attacking Hillary. Topic 2 is about the US economy and bringing jobs back to the US. Topic3 contains main first names. I am not quiet sure what it is about. So far I interpret it as Donald speaking about people he would hire for his later cabinet. Topic 4 is all about making America Great Again with DJT. Topics seem to make sense and are clearly related to what we also have in mind when we think about Trump’s campaign last year. So lets now see how these things develop over time. 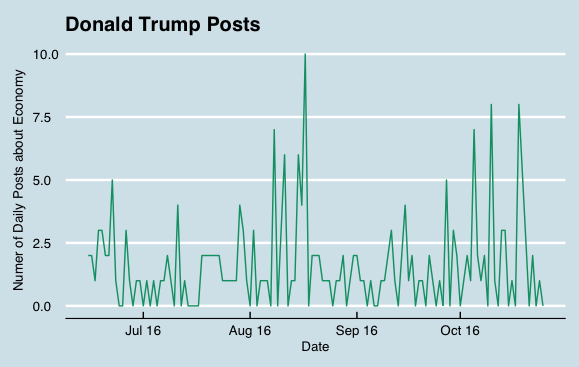 I use ggplot to create some timeseries graphs to observe his behavior. First lets see how things walk together. Well, what do we see here? Right, a lot of lines which prevent us from a clearer picture. Even though this looks quite messy (not too say huuuugely), we see some differences in magnitude as well as in posting timing across the four identified topics. 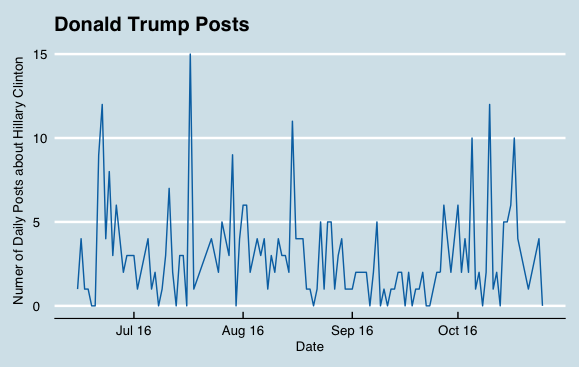 It is quiet interesting to see that Trump is addressing the different topics at different times. He is attacking Hillary at the beginning and at the end of the campaign, but tones down in the middle (late August 16 to early October). Economy seems to get more attention towards the end of the campaign with the elections coming closer. Also he seems to get more concrete about other people towards the end of the campaign. 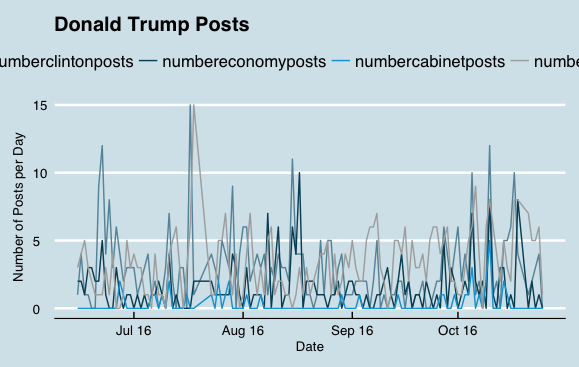 Looking at the fourth topic category we can see that Trump’s post related to himself are even evolving over time. So his ego got apparently bigger during the campaign. So long! Or for this special context: Good Night and Good Luck America!